Like every year, once again I want to wish you a Merry Christmas and extend my holiday greetings to you all! I am really sorry you haven’t heard from me in a while but yeah… what can I say; we moved to another place, jobbed on and off, argued extensively with ministries and I am still trying to survive the paper chaos of our modern bureaucraZy without getting a brain tumor… but I guess the biggest change in my life recently was the birth of my son, who is now already eleven weeks old. How the time flies! – Exactly, and between sleep deprivation, taking care of the baby, working on a few projects and so on, there really was no time left to put out reviews. I didn’t even manage to be on Twitter that much… which is… ridiculous. But seriously, seeing our small boy smile every day is worth it. I don’t want to make any promises but I really hope to be back again next year with more and regular posts. There are still too many games on my list, to many reviews in edit and in general too many things to say. I hope you will remain and check by some time. In the meantime have a great Christmas time and celebrate the New Year with a bang! It has to get better at some point, it just has to. Stick to what you love, support each other and it will work out sooner or later. Somehow I feel like there haven’t been to many lastingly positive reviews among the latest posts I put up… BUT this one will should balance it all out again! 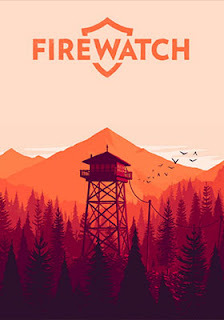 It’s already been a while since I played this game and its release for that matter, but seriously; Firewatch was one of the best games I have ever played and I highly recommend it to everyone who hasn’t played it yet. There are a few points that could have made it an even better game in my opinion but compared to all the other games that surround us Firewatch is a true contestant for the title of game of the year 2016! 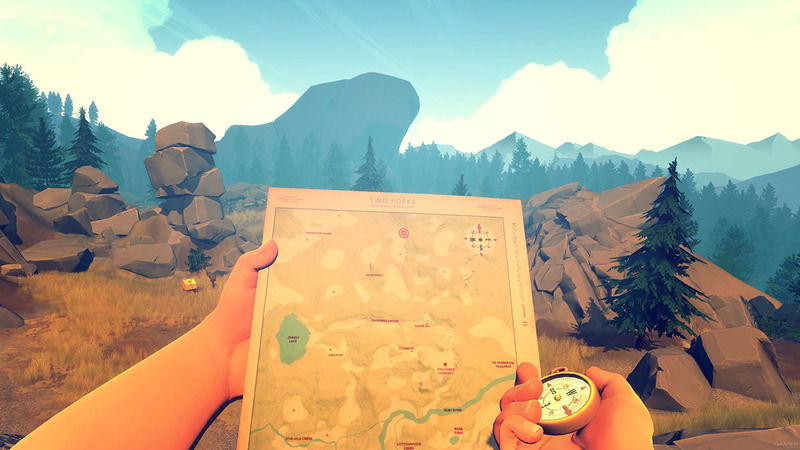 Firewatch was made possible by Campo Santo and Panic and is available on Steam and PS4. Not aiming at hyper-realism but in general having more of a cartoonish look to it, the game’s graphic and art style is nothing short of brilliant. Because the game's visual art is perfectly coherent in style and consistent in its quality, together with harmonic colors as well as a remarkable work on the ambient lighting, Firewatch makes the environment feel pleasant and warm. 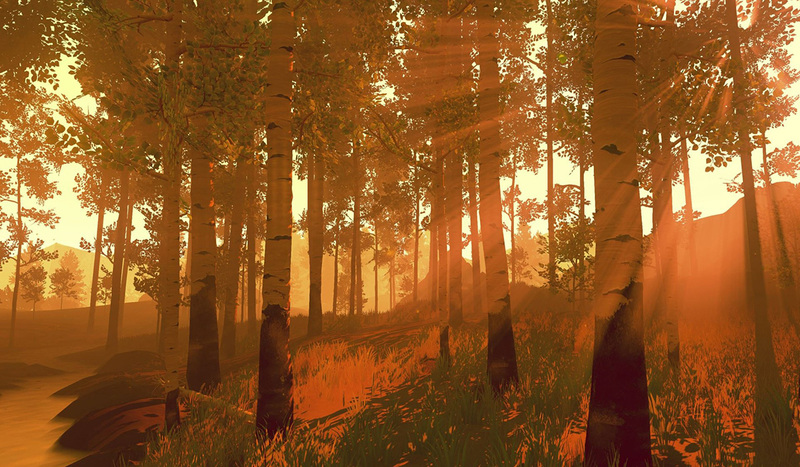 There are no procedurally generated environments, there is no tree without a purpose; at Sunrise or sunset, with fog or smoke, the handcrafted and thought-out sceneries in this game are the perfect relief after a stressful working day. 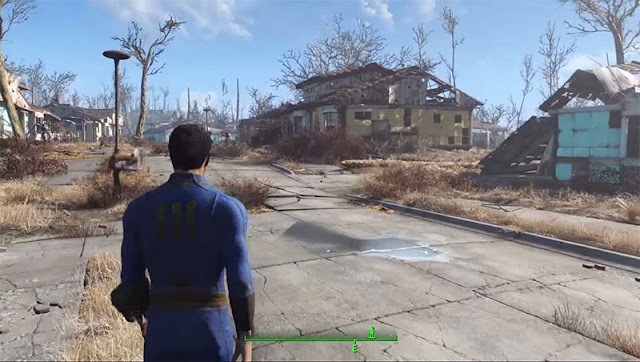 It shows why level design is also important in games that play outside and why more people developers should emphasize working out their levels instead of mass-placing terrain assets. At its core Firewatch is a narrative driven first person game. So, if that is not your genre well… but otherwise in my opinion it is safe to say that is one of the best of these kind gaming experiences there is. 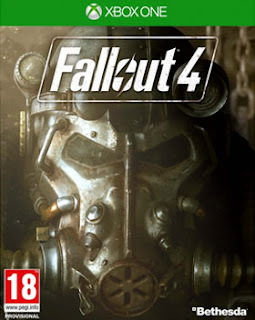 Not only does the game make you feel as if you were playing the story in a deeply interactive way because you can always choose what to say next, it also has a great, sentimental and intoxicating plot with few but highly elaborated characters. I don’t want to talk in more detail about it since I don’t want to spoil it for those of you who haven’t played it yet, but I will talk about one point that makes this game so special compared to similar ones. 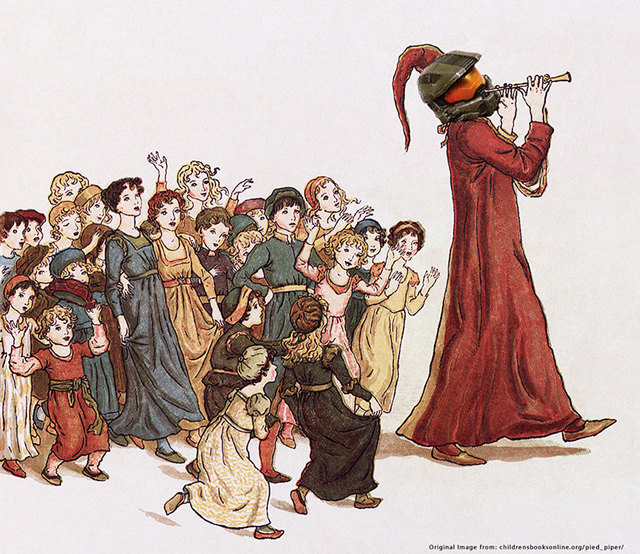 There is a twist! – Or rather the story is constantly twisting your mind! This game is does not only put you in a massively immersive setting where you still could easily get bored from redundancy for example. No! From the moment you start reading the first lines of the plot, which already hooked me before the game even started, there is not one moment where you feel sort of “And now what?” or “Boring!”. This game always drives you forward. 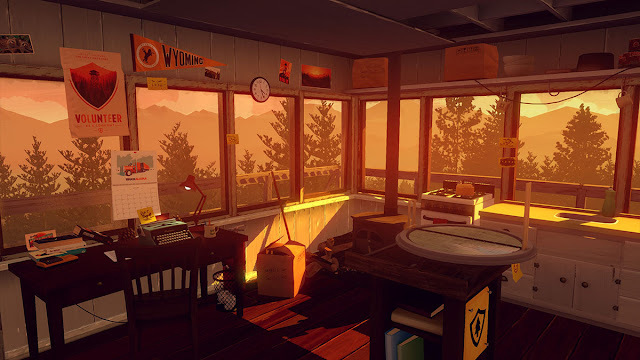 Smoothly and not with force there is always a purpose to all you are doing and every single trip you take to the forest, as the Firewatch-sheriff you are, adds more to a mystery that is constructed by your very own imagination until it all makes sense to you at the end. Ok, admittedly the end – the very end – of the game has been criticized somewhat justly because it simply does miss that certain climax. On the other hand I think you could say that the game didn’t need it because of its constantly evolving nature. However one of the points I think the game is definitely missing is multiple endings. - That could have solved the issue with the end and furthermore encouraged people to play the game more times choosing different approaches and experiencing a whole different story with other dialogue options. 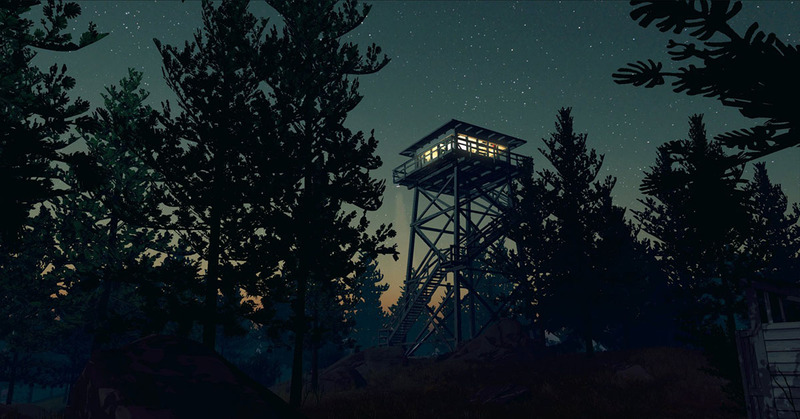 Especially given the overall playtime of about 2 to 4 hours at best, it is a shame that Firewatch has no immediate replay value whatsoever. It wouldn’t even have been necessary to put in more stuff for the players to explore, if they just had worked out different endings and certain key decisions in the game to favor one or the other… damn, this game would have be perfect! But honestly, coming back to the playtime of “just” some hours; I really do have to say that in the case of this game the rather short playtime felt great to me. You know how most games try to push gametime with ridiculous measures like sending you back and forth, giving you redundant tasks and so on. There is nothing of that sort in Firewatch and that I want to applaud until my hands get blue. I would rather spend 3 hours of quality time than 15 hours of annoying repetition and pseudo-gaming! We did not know too much when we played the game. Yes, we knew some trailers, and honestly we had a completely different idea of the game (more on that later) and then on the same evening the credits rolled. – It was a great feeling to finish a game in one session, given the time constraints life brings with it as you grow older. Like I said, the only bitter pill is that now since I have played it once there is really no reason to play it again soon. I know what the story is and how it works, there is nothing more to explore and unfortunately not even one alternative ending. 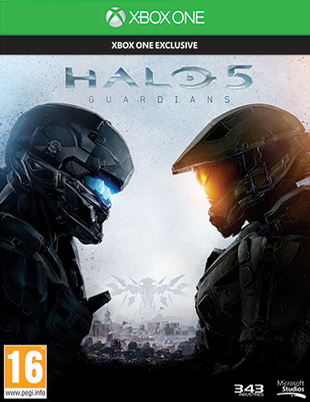 Lastly I just have to mention that just from the E3 trailer alone this game was seriously advertised wrong. Many people say that in the great big web and in my opinion they are right. You see a vast forest, there’s a serious and rather dark tone to it “The isolation gets to people”, “Two young woman have been reported missing”, “Then,… who is [in your tower]?”, you see a guy picking up an axe… Do I have to say more? Still, why didn’t they show selecting a dialogue option or write somewhere something like “Walking Simulator” or “Story-driven”? I think nowadays you have to promote the true type of the game you are making a bit better and this might be one of the few cases where I can related to some of the younger Minecraft kids, wearing their brains with questions like “What is this?” or “Why are they talking so much?”. – Oh, and on that note: You see people? This is how you do it in this kind of games! Let the people talk! There can be some notes to read but tell the story with real, and like in this case, good voices. I really don’t know why this part always comes up so separate from the rest of the game… maybe it’s just hard to talk about everything at the same time? Anyways, the soundtrack of Firewatch is simply put a musical masterpiece. Not only in regards to the game and the atmosphere it conveys but also musically and on its own. It has already landed in my playlists for programming, relaxation, outdoor- and forest related adventures, and many more. I can listen to this soundtrack all day long and still find it great. "YOU GOTTA GO SEE HER, HENRY." Again; I highly recommend this game to everybody searching for a great story experience circled around loneliness, and the attempt to escape the more demanding circumstances of life. 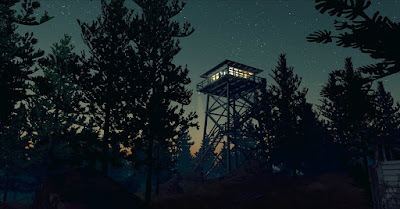 Imagine spending some months in summer on watch in an isolated tower in the middle of the wild; no phone calls, no internet, just the sun rising and setting down, only the wind in the trees, books to read and the radio to chat with the other towers. Every once in a while you would have to hike out and check everything is in order while witnessing the true wonders of natures. Wouldn’t that be something… something real? I am very proud to finally go public with the current project sIPXgames is working on: StreetJustice. Over the course of the last year I was lucky to get to know some other indies from Austria who not only share a similar passion and understanding for games but who also wanted to work together on a mutual and for the first time commercial project. Coming from various backgrounds, we quickly formed a harmonic team and complemented each other's skills. Although we might be considered as startup and the "best is yet to come", to put in the obligatory game quote, I think I speak for all if I say we are taking the production of this game absolutely seriously and we even aim to have a demo press-release ready by the end of this summer. At the moment we are 5+ people and we have covered all the key positions necessary to work according to our project plan and to our personal standards of quality, of course. Besides production, design, 3D stuff and writing I will of course take care about trying to give you the most information, education and entertainment possible. Although I am not yet sure what that means... I am certain there will be all kinds of different contributions in form of blog posts, devlogs and/or vlogs, maybe even some live streaming or other fancy stuff. In this post I will however stick to the (old-fashioned) pen&paper-approach and try to outline most the aspects of the game. I know already now that it will surely go beyond the scope but I would rather get done with the preliminaries so that we can get into detailing individual topics with posts along the road. Before talking about the game in detail I why don't we take a look at the motivation behind the idea first? I am a driver and I am not particularly proud of it. I am maybe proud to be a responsible driver, but if it was up to me *insert evil laughing cat* I would surely prohibit more than 50% of the cars currently driving around in Austria and rather improve the public transportation. Unfortunately though I am living in a time and a place where, despite the fact that it is getting better, public transportation is still either non-existing at all (especially outside of major cities) or if; unreliable, slow and way too expensive. - The latter of course getting worse every single year. Most of the other developers on the team are drivers as well, and we think that there are some serious problems when it comes to driving in Austria: There are masses of irritatingly old sport bicycle drivers in spandex pants, annoying horse transporters, an almost infinite amount of tractors and trucks for example. There are drunken drivers, too young drivers and too old drivers... and somewhere between the occasional horse riding along the road and an annoyingly loud scooter of a rebelling teenager, few absent-minded even come up with the ideas for an illegal street races with their completely unnecessary cars. Individual cases, you think? - We don't. We think driving a car is currently one of the most dangerous things to do. There are supposed to be rules; like that you have to stop your car for two seconds at stop sign no matter what, that you cannot overtake a car in a zone where it is clearly forbidden, that you should not drive too close to the car in front of you, and so on... Unfortunately, despite those being very reasonable rules, to us it seems nobody cares to follow them anymore and we also agree on that the situation is getting worse. It's not only that people are not following the rules anymore but also that they seem to be lacking any form of respect for other traffic participants or a general appreciation of life for that matter! Yes, driving is war! And while the sounds of it can be heard everywhere outside, there seems to be less and less police on patrol and taking care that people behave. Well, while we kind of understand why we are almost back in the Wild West, we still don't have to like it and decided to take the law into our own hands and give you a police man with the rights and the means to clean up the mess. There will be no negotiations, no bribing, no escape,... if you break the rules you will be blown to pieces no matter if you are a regular person, a gang member or a trespassing deer. Hopefully with that said it becomes clear that, although we will do our best to make fun of our small and proud home country, we don't want to push agendas here. We don't want to send subliminal messages and convince people of some greater and reasonable purpose or secretly point fingers. We are making a game! Yes, the game is based on real places and real impressions but there is simply too much material to be left alone and not made fun of. Naturally StreetJustice is going to be subject to interpretation but let's keep in mind that it remains entirely fictional and that it will be a game that is supposed to be funny and entertaining! So, how will the game be? 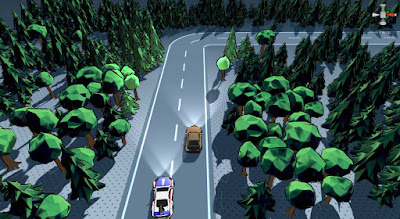 Above all other things StreetJustice will be a driving game. Despite us working with an abstract layer of the most realistic physics I have ever seen on an artificial car, the game will definitely feel more "arcady" and not like a realistic simulator. 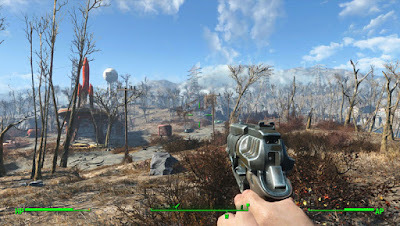 We want awesome handling, action, explosions, fast-pace driving and shooting on the one side but also adventures, exploration and tactical gameplay on the other. For us "patrolling the streets" means to take care, to learn and obey the rules yourself and to blend in. But if you spot a crime... BOOM! - Justice! As you can see in this first-ever (early) screeshot of the game, graphic-wise we are going with a fusion of cel-shading and low-poly 3D inspired by comic books with a perspective trying to convey the feeling of an old-school top-down game. Initially I really was not that much of a low-poly fan but I have to say that I am pretty happy by the results we are getting and how our art style is coming together. In the end we strive to have a rather vast representation of Lower Austria for you to explore and have fun with. We don't want to confine you to the streets, on the contrary: We want to encourage you to use farm tracks and scout the land to find more quests, crimes, resources or just magical places. We want you to feel as if you are really driving in Lower Austria: There will be rapeseed, pumpkin and wheat fields, wind wheels, purple cows and all that good stuff we see all the time. As indicated before in StreetJustice you don't just drive around and shoot bad guys. Although we want the game to feel as energetic as an arcade shoot 'em up from time to time, we can't stress enough that you are supposed to be the "good" guy. You will play the role of Paul Frabitz, one of the last remaining police officers and head of Street Justice Department 3. That means you not only have to patrol the streets but you also have to manage and expand your home base and influence. You will need to hire and assign workers, deputies and scientists, research new tech and weapons, gather money and resources, build new parts to your base, discover and revitalize old abandoned police posts, and much more. Only with your equipment being constantly improved will you be able to complete the story campaign structured in simplified quests similar in style to any given open-world game. - Actually really classic and colorful rpgs might be an even better comparison. Since we will be having lots of fantastic vehicles and playable characters, we are also working on a multiplayer mode for the game that supposed to be the cherry on top. Currently it will work only offline and locally but it is already supporting up to four players simultaneously. 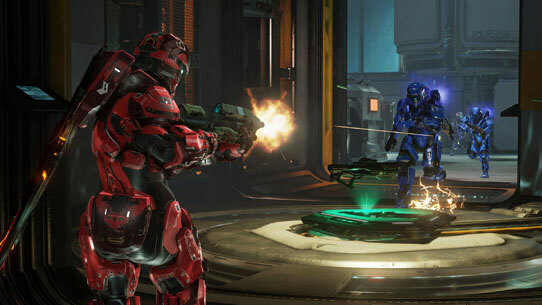 Maybe in the future, depending on how things go, we also consider making the multiplayer modes online. I honestly can't tell you too much about the multiplayer since that is just secondary process and not entirely thought through. For now we only have one mode and that is an arena/deathmatch type similar to games of the Super Mario Kart or Twisted Metal series that was originally developed to test out our weapon and driving physics. 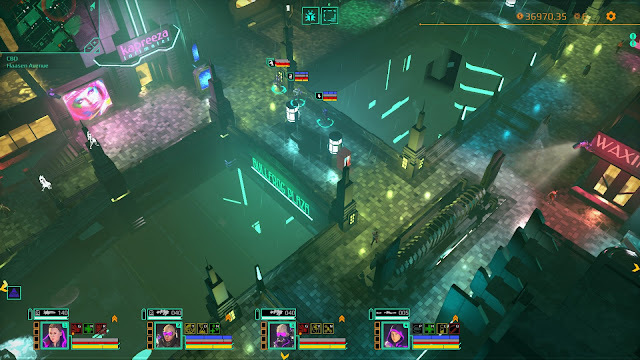 Back in summer 2013 5Lives Studio succeeded at kickstarter with Satellite Reign, the "spiritual successor" of Syndicate Wars (video). I couldn't have been more excited myself, was this the first campaign I ever backed and became part of. Now - well, actually already about 5 months ago - the game got out (for example) on Steam. WAIT... DID I KNOW WHAT I WAS GOING TO GET? While Satellite Reign definitely did a great job with the graphical environment, the class-based tactical gameplay, the setting and an astonishing soundtrack, there are unfortunately a few things missing to make this game really stand out in my opinion. Some of those negative points include for example the story, of which there wasn't any, if you ask me, but also too repetitive thus boring missions. Admittedly, the great gameplay possibilities and completely situational AI behavior make every mission unique in terms of what will happen, but the goal of the missions always remains the same: Get in, steal something and/or kill somebody and get out! All the game's "objectives" play inside of designated areas that are always separated by walls or other obstacles from the real city. While this is a good design choice that benefits production and also gives players who tend to get overwhelmed with real open worlds a more structured angle of approach, in this game it sadly deems the city to something that is just there but gets hardly noticed. - A shame given how visually appealing and deeply atmospheric they have actually mad it. Unfortunately the game doesn't convey the feeling of an adventure going on inside the real city because there is nothing to do there. Although it can get pretty tactical I guess most people brute force their way through the game. Honestly, one single agent is just too weak to do anything alone. And since the game is not very reluctant once an alarm has been triggered, which means that an almost unlimited amount of enemies keeps spawning in the closest garage and keeps charging at you... well, as I said, you either have all four agents or only the Sniper who can become invisible. Personally I don't see any other option. Either way, as soon as you enter the second district of the city you will most certainly get a feeling of déjà vu and find yourself doing exactly the same as before, just with stronger enemies. What disappointed me the most in this game however was not such a trivial thing as repetitive missions. With an immersive game world like that, I don't care about that. At some point I actually like it. For me the game's deepest problem is located within the fact that it might have been a bit to overambitious for a studio the size of 5Lives. As I said, I had a close look on the game during the whole development process. 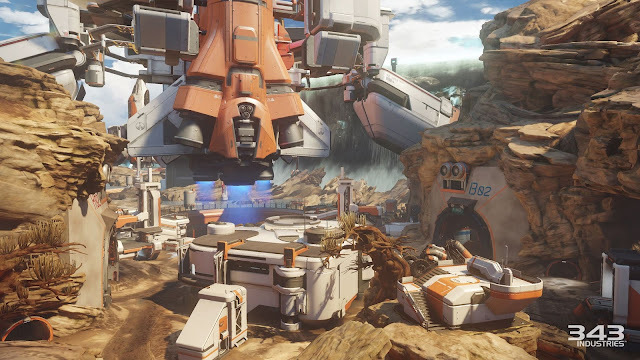 What shocked me most was that the very first alpha I played was actually not that much different from the final release. Don't get me wrong I know how much work is in there (even the things that most players usually don't see) and I also understand development cycles, but at the end of the day I am left with a game that to me didn't hold what it (intuitively) promised above all; being a better and modern Syndicate Wars. I see a product that had to be finished under great time and mostly money constraints. I see a city that got too big because of kickstarter campaign goals and thus took way too much precious time to complete. I am sure at some point about a year ago 5Lives had to make a decision. - To me it seems they decided to strip their game of any feature other than promised in their campaign and just concentrated on delivering. Of course I am merely speculating. Here you see one of the first videos from the development where they showed how the character augmentation screen/menu would be like. Isn't that awesome!! I must have watched that video a thousand times back then. Why? - Because that screen is precisely what is the most important aspect about Syndicate Wars or - if you will - any spiritual successor of it. Yes, we are talking about development, some features go others come, but honestly dropping this very screen - a screen that I think 5Lives knew of its importance - seemed like ripping the heart out of the whole game and even makes the old menu shine in comparison. We all know that the Syndicate series is not only about running around in the city and shooting "bad" guys. Syndicate Wars as well as Satellite Reign are games with a very distinctive strategic component! 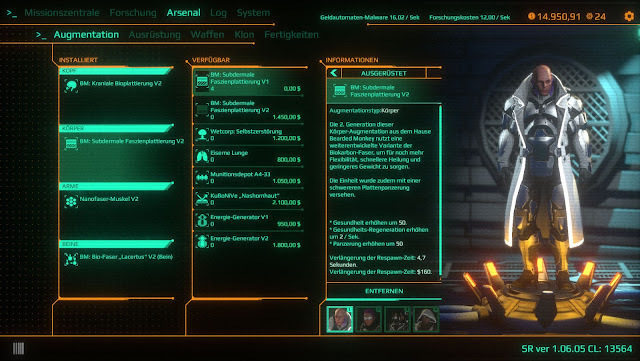 And like in any other strategy game, the base building / unity management screen is the focal point of any character development and thus immersion to the game. - Even if the characters seem like mere cannon fodder and probably are totally replaceable. Upgrading them, nursing them, educating and customizing the very units you play with is exactly what makes a good strategy game! We, the god-like commanding players, need that connection to our soldiers or else there is no depth to any of it. With this menu, where you can do nothing more than click a text/skill A to replace it with text/skill B so that character C can have text/skill C, one of the - if not the - key component of the game is completely gone, despite all our expectations. 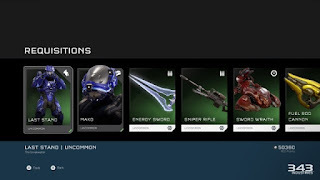 I wished they would have stayed with the old menu and also that they did something similar to the weapons and the skills, but as I said, obviously they didn't have enough time for it. This is what I meant with "I hoped that they were hiding something from us" and to further paraphrase: "I expected the real magic to be shown only in the release version". Like I said, there are more negative or rather neglected points to Satellite Reign but I think this review is already getting too long. Overall the game is great and absolutely worth getting it for that price! I think this is as close as we will get of a strategic cyberpunk game that feels like Blade Runner and plays like an actual game - a game from the 90s. Yes, it is terribly sad to see how it failed to get close to probably even half of its total potential and it is sad to speculate why that is the case. At the end of the day nobody should criticize 5Lilves too much for they did absolutely amazing work on that game. Oh and by the way: They are still keeping it up! - Despite the fact that it wasn't reached in the campaign, they are at this very moment actually working on implementing cooperative multiplayer (post from November 2015)! Can you believe that? How can we not draw our hat before 5Lives Studios! Let me finish this post by wishing you all once more a happy new year! 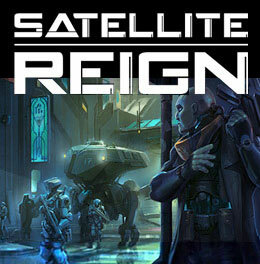 Now that 2015 has finally passed I would like Satellite Reign to be remembered as a game from that year; from a time where almost anybody can make a game but only very few have the money to really make it. A time where the gap between few multi-million AAA productions and millions of - well - B+ indie games was never bigger. A reality that leaves us gamers and developers with only one crucial and striking truth: Similar to how most developed societies completely lost their middle classes by now, so did the game industry lose its sweeping and productive AA studios. In my opinion Satellite Reign is not a success story. - Well, not the one I hoped for at least. But it is the closest professional attempt to work on a AA production and to rekindle that flame of independent quality, traditional gaming, innovation and immersion I have seen in a while! I think this is what we should remember about 2015; A game like Satellite Reign, that per definition at least tries to shape the face of gaming... and not games like Halo 5, Fallout 4 or Battlefront!